Chicago, IL–(ENEWSPF)–August 3, 2017. 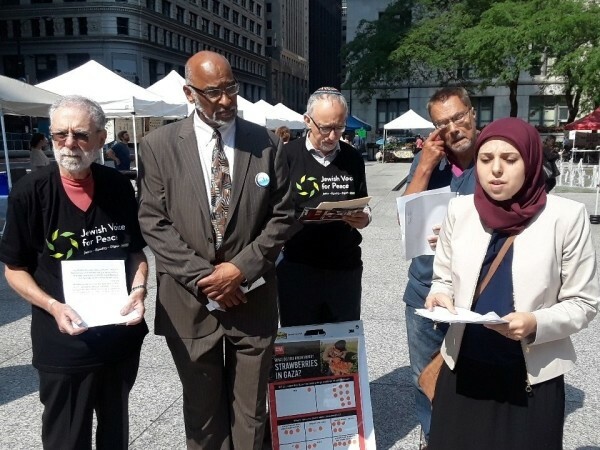 “Did you know that Gaza once had a thriving strawberry industry?” Muslim, Jewish and Christian leaders posed this question to shoppers at today’s Daley Plaza Farmers’ Market in Downtown Chicago, as they participated in the American Friends Services Committee’s #GazaUnlocked campaign. This followed a brief press conference addressing Israel’s responsibility for the escalating crisis in Gaza and the violent crackdown at Jerusalem’s Al-Aqsa Mosque. 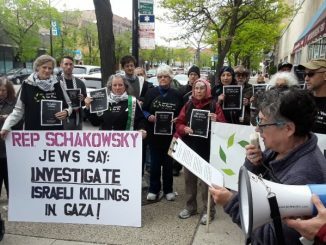 The gathering took place the week after hundreds of Chicago-area Palestinian-Americans and allies protested Israel’s violent suppression of peaceful mobilizations by Palestinian residents of Jerusalem. These were sparked by anger at the installment of “security measures” that, in the context of the ongoing military occupation of the West Bank, are meant to extend Israel’s control of the Al Aqsa Mosque, one of the holiest sites in Islam. Israel’s brutal policies toward Palestinians have led to a particularly acute moment of humanitarian crisis and instability. 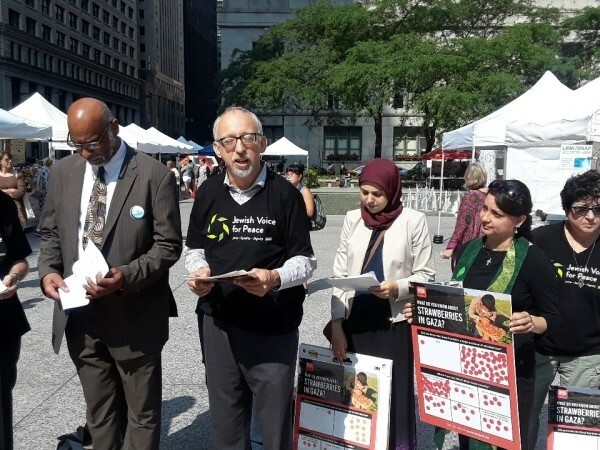 Participants urged Chicago-area faith leaders to move beyond dialogue efforts and address the issue of Israel’s oppression of Palestinians head-on. “Interfaith dialogue that is predicated on excluding Palestine from the conversation reinforces the idea that violence is the result of an intractable religious conflict, as opposed to Israel’s brutality toward Palestinians as a means of maintaining total control over the land,” said Rev. Donald Wager of Friends of Sabeel – North America. 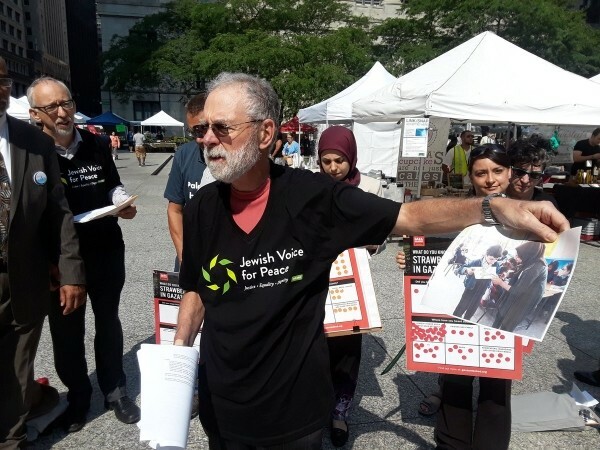 After the press conference, the group split up and approached shoppers at the Daley Plaza Farmers’ Market to educate them about the devastating impact of Israel’s blockade on Gaza’s once thriving strawberry industry, as a means of illustrating the crushing humanitarian crisis that has developed. Participants pledged to continue working to build an interfaith voice in solidarity with Palestinian rights.